City permit 16-031. This single family home has just been completely remodeled/rebuilt with brand new everything! New memory foam mattresses with new bedding, cork flooring, stainless steel appliances, fully-stocked kitchen, washer/dryer, new furnace/hot water heater, outdoor patio, covered deck on a quiet in-town dead-end street. It includes off-street parking and bikes in the shed to use for excursions to the main downtown area. The open floor plan of this home makes for a comfortable setting for families, couples, and friends. We are a Colorado-native family with two teenage children, 2 dogs, and 2 cats. We consider ourselves lucky to live in Durango with so much to offer, including great weather and a great community. We enjoy skiing, fishing, biking, hiking, rafting, camping and paddle boarding. Nate is a fly fishing guide and has spent many years teaching skiing as well. Tammy is not a pro at any sport, but enjoys being outdoors and participating in all the activities Durango has to offer. When we travel, we prefer staying in vacation rentals and so wanted to offer our version of a perfect vacation rental to others. We consider this the perfect location to call home when travelling to Durango. It sits in a great location, in-town, on a quiet dead-end street with great neighbors. It is within a few blocks of the Animas River and the Animas River trail system that spans the entire town. 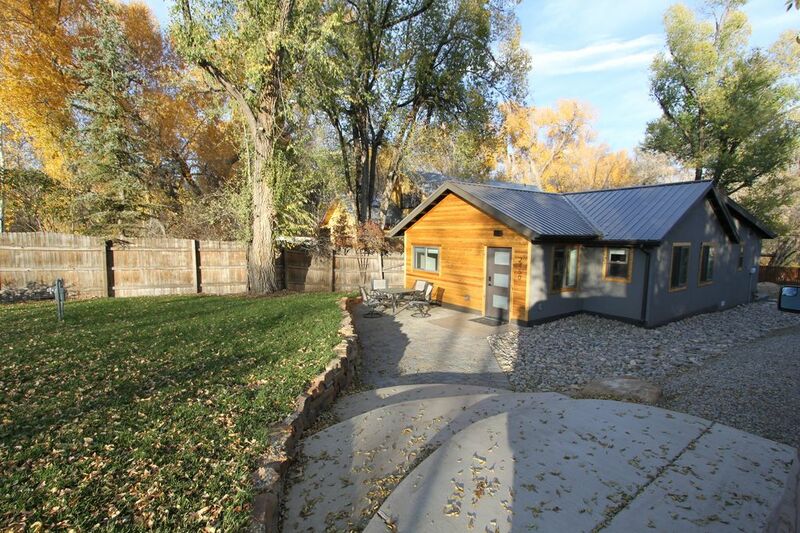 Home is located within blocks of the historic downtown area of Durango. Located within walking/biking distance of most everything in town. Off-street parking for 2 vehicles. 2 couches, one is a very comfortable futon-style couch for additional sleeping. The kitchen is stocked with some basics, such as oil and spices, salt & pepper, sugar. Fully-stocked, new cabinets, brand new stainless steel appliances, Quartz countertops, electric kettle. Bikes available in shed, with bike locks. Purgatory just 30 minutes away, Hesperus just a 10-15 minute drive, many options in town and out of town for snowshoeing, hiking and Nordic skiing. Public tennis courts right across the street. One story home with wide doorways. The front does have 3 largely spaced steps from parking area to front door-see pictures. Great modern house in a central location. We loved our stay, the house was perfect for our family of 4. It’s well laid out with a great kitchen. My kids loved the loft and the location was central to town. We spent 4 nights at this property visiting family that lives in the area. The house is lovely and charming and so clean. It was so comfortable and spacious. Great area of town too. The owners were wonderful, the driveway was shoveled out for us when we got there and they were available for any questions. We would stay again at this home in a heartbeat and hope to on our next visit to Durango! This place is perfect and the owner's are amazing. Exactly as pictured. Very cute and clean! We were here for 2 nights and had a wonderful stay. The house is brand new (or recently remodeled) and very clean. The place was literally outfitted with everything you could possibly need. Clearly there was a lot of thought put into taking care of the guests every need. The location was at the end of a quiet street across from a school and approx. 1-1.5 miles from the city center. Bikes on site will get you down town in no time and come with locks. Highly recommend this home.